The sources for the present transfers were American Victor “Z” pressings for the Vivaldi; British HMV shellacs for the Beethoven Romances; a Japanese LP transferred from the original wide-range lacquer masters for the Mendelssohn; and 45 rpm vinyls for the Paganini. 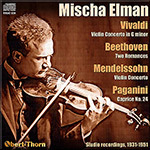 The original recording of this last item, an elaborate arrangement by Elman, is rare and has never previously appeared on CD, as have neither the Vivaldi nor the Beethoven Romance in F. Some swish is inherent in the master of the second side of the Vivaldi, and there are occasional gritty patches on the lacquers that were used for the Mendelssohn concerto’s LP transfer. Elman was born at Talnoi, Russia, January 21, 1891. He studied at the Royal Music School in Odessa under Fiedelman, first appearing in public in 1899. Professor Leopold Auer was a member of the audience, and at his suggestion Elman went eventually to St. Petersburg in 1901. He came under the personal supervision of Auer and made immediate progress. Elman’s début was made in Berlin, 1904, and his success was immediate, bringing many engagements all over Germany. The following year he appeared in London, and the success he had already achieved in Germany was repeated in England. His first tour of America took place in 1908, and American audiences at once endorsed the opinions of Europe. Few musicians have achieved so fine a reputation at such an early age, and there appears to be little doubt that Elman’s future career will be as successful as that of his prodigy days. At first his style of playing naturally showed the influence of his brilliant teacher, but latterly he has developed a style of his own which marks him out as an artist of great individual attainments. His repertory includes all the great violin concertos and solos. The violin which Mischa Elman used as a boy was a small Nicolas Amati; latterly, however, he has used a Stradivarius, dated 1727. This instrument is in a fine state of preservation. Mischa Elman (1891-1967) studied with Leopold Auer as a young child and made his debut at the age of 13. He recorded a prodigious number of acoustic Victor records, some with his own string quartet, and some with such artists as Caruso and Frances Alda. He was in the same celebrity class as Kreisler, and second only to him as a gramophone bestseller. Then his career perhaps started to shine a little less in comparison with some superlative contemporary violinists, and it was only partly due to the depression that he made fewer records in the late 1920s and 1930s. After the war he made a handful of mono LPs for Decca, and then one or two stereo recordings for Vanguard and Philips. Although Mischa Elman recorded much of the repertoire appearing in this Pristine collection on other occasions, Pristine claims as first releases on CD Vivaldi’s concerto (in Tivadar Nachez’s edition, now widely held in disfavor), Paganini’s 24th Caprice (in Elman’s own arrangement), and Beethoven’s Second Romance. Elman recorded Vivaldi’s concerto in Kingway Hall in London on September 29, 1931 (he would later record it for Vanguard), and though Elman may have stood in almost diametric opposition to the ideals that led to the historically informed movement a half-century later, his earlier performance reveals through whatever romantic mannerisms encrusted it (when he plays along in the tuttis, his portamentos make him stand out from the ensemble) an almost timeless musicianship. He endows the first movement’s passages with a logic as rigorous as that of his more scholarly successors (but also with the glow of his fabled tone), brings the serene lyricism of one of Bach’s slow movements to Vivaldi’s Adagio, and a sprightly playfulness (some of it purchased at the expense of a rhythmic freedom—or would we now call it waywardness?—that might no longer pass muster) to the finale. On the whole, he carries the concerto far beyond the stylistic limitations that more modern canons might impose on it. The transfer by Mark Obert-Thorn minimizes the apparent age of the American Victor “Z” pressings (the notes mention some swish in the second side of the masters). Elman recorded the concerto again in 1960, for Vanguard (rereleased on OVC 8033), with Vladimir Golschmann and a chamber orchestra of the Vienna State Opera, and it’s surprising how springy Elman remained in his late-60s, while Golschmann’s orchestra plays with what even by then must have seemed old-fashioned mannerisms, similar to those from the recording almost 30 years earlier. The Romances hail from EMI’s Abbey Road Studio No. 1 on November 30, 1932, (transferred from British HMV shellacs) and present a somewhat more chastely scrubbed portrait of Elman’s tone. He employs what seem more discreet portamenti in the First Romance, though the tone that made him famous retains its beauty while at the same time giving the impression of sinewy strength. The portamento in the opening figure of the Second Romance seals his performance with an identifiable signature, but little in what follows seems distorted no matter how personal. The passagework in the Romance’s middle section plays out with an inevitability that’s more ineluctable than indulgent. Elman’s recording of Mendelssohn’s concerto for RCA Victor with the Chicago Symphony Orchestra conducted by Desiré Defauw on March 8, 1947, sounds somewhat harder and edgier tonally. His performance seems almost as taut and propulsive as a rendition by the violinist who had over the years become his nemesis, Jascha Heifetz. (RCA Victor rereleased it on LP with Wieniawski’s Second Concerto as LM-9024.) Elman descends with absolute and absolutely thrilling authority to the pedal point on the open G string that accompanies the movement’s lyrical theme, and he slows down before the cadenza, although not nearly so dramatically as David Oistrakh often did. Those who consider Elman the embodiment of unbridled self-expression might want to reconsider their assessments after listening to this at times muscular account of what might be taken as a feminine, or at least Apollonian, concerto. The second movement, though unhurried, sounds similarly unindulgent (though enhanced by some extraordinarily expressive lyricism in the upper registers introducing the middle section), while the finale sparkles at a tempo that hardly seems heavy-handed (as some might view tempos in Elman’s later recordings). The recorded sound accommodates enough orchestral detail to transmit some of Defauw’s intelligent design. In May 1959, Elman recorded the concerto again, with Golschmann and the Vienna State Opera Orchestra, for Vanguard (rereleased on CD as OVC 8034); as with Vivaldi’s concerto, his performance still maintains its landmark features, sounding, if anything, tighter (the timings, except in the finale, which is longer by only a few seconds, remain similar but a few seconds shorter), and the descent to the pedal accompanying the second subject isn’t quite so magisterial. Elman’s recording of Paganini’s caprice came later, on April 3, 1951, in RCA’s Studio No. 2. The drier but hardly less lifelike recorded sound reveals an archness in Elman’s playing of this hard little gem that might not have often come through previously. Elman had reached his 60th year when he made this one, and technically, he still for the most part fired on all cylinders, while making a haunting statement, for example, in the variations in octaves and a smoldering one in the variation in descending thirds (only the chordal variation sounds labored, but compare the chordal variation in his performance of Fritz Kreisler’s set of variations after Tartini, on a theme of Corelli), and his passage on the G string in the Paganini set sounds glutinous though robust. For those who admire Mischa Elman’s approach to the violin, Pristine’s collection will be obligatory, but it should also be so for those who have viewed his art with jaundiced suspicion, wondering why so many admired him so greatly. Here’s why. Recommended with the highest urgency.